The Hill High Country Store is now Hill High Marketplace at 35246 Harry Byrd Highway, Round Hill. After 30 years, the Hill High Country Store closed in early 2014. Below is its history. It is now run as the Hill High Marketplace. It was just west of Round Hill, on business Rt. 7 where there was an old covered wagon sitting in front of a large white building. The building was originally the apple packing house and cold storage for Sleeters Orchards. A trip to the old covered wagon has become a holiday tradition for hundreds during the holiday seasons. What’s behind the covered wagon that has drawn people there for over 30 years? Home baked pies! During the week of Thanksgiving this small western Loudoun business bakes and sells over 3000 pies (and then does it again for Christmas!). As expected, the biggest holiday sellers are pumpkin and apple. However, shoppers can chose from 38 different kinds of pies, including sugar-free fillings. But will people drive to Round Hill just to buy a pie? Well, they buy more than just a pie. 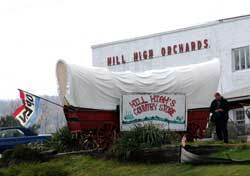 Hill High Country Store features local fruits (apples galore! ), local apple cider, jams and jellies, country hams, and country crafts. Not to mention one of the best soup and deli selections in western Loudoun. Ron Heimburger bought the Hill High Country Store business in 1993. The store used three convection ovens to bake pies 24 hours a day the week before Thanksgiving and Christmas. Ordering pies early was highly recommended to assure the pie you want is available. “It’s a great business,” Heimburger said nostalgically this week, asking where else could you buy pumpkin, lemon meringue, apple or peach pies for $7.99. Other places are selling pies for $13 or $14, he said. He even thought of raising his prices, but said with the business closing next year, he thought it better to leave them as they are. So, buyers are warned—there’s not much time to get some of those famous pies. People come from all over the nation and overseas to purchase the pies. “That’s the truth,” Heimburger said. “Mt. Weather has classes for federal employees. They come in here every Friday and say they’re flying back … and ‘my wife told me don’t dare come back without one of those pies,’” he said. A knowing look came over the women’s faces. “Oh, they have the best pies,” was their surprising comment. 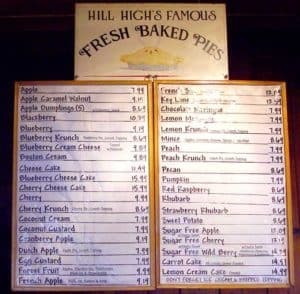 The pies are not baked on the premises, even though Heimburger said people used to have the notion that Mary Sleeter, former owner of the Hill High Orchard that once surrounded the store, was peeling the raw fruit in a back room and baking them. Maybe in the very beginning, a few were done that way by Mrs. Sleeter to use up excess fruit that was being stored in the back room, he said. But, for a long, long time, the pies have come in ready for baking. “They’re the same old pies, they come in frozen, they’re made elsewhere,” he said. Just enumerating some of the 38 kinds of pies Heimburger sells made one’s mouth water: blueberry, peach, apple, apple caramel walnut, a blueberry cream cheese that’s melted and trickles down through the blueberries as it’s baked, plain rhubarb, strawberry rhubarb, and key lime pie from Key West. Thanksgiving is the biggest selling time of the year. “Everybody’s buying pies at Thanksgiving,” Heimburger said. Tuesday of this week, employees sold 1,304 pies. The Wednesday before Thanksgiving, the number was 1,570. So how did this business start to become such a holiday tradition? Well that goes back to the Sleeter family that once had over 850 acres of orchards in western Loudoun. Between the loads of apples and peaches, and after the fruit was placed in cold storage, Mrs. Mary Sleeter would peel the fruit and make pies from scratch. The customers would come in to buy fresh fruit – smell those pies baking and buy one to take home. According to Round Hill historian Ann Thomas, the couple’s first run of apples was called Colonel’s Pride, while second-grade apples were marketed under the Sleeter brand. In 1948, Thomas said, the colonel instituted a fruit refrigeration plant and his wife oversaw the entire operation. Kenneth Lowery came to Hill High in 1956 and managed it for more than 35 years until the early 1990s, when the colonel’s son, John Sleeter, sold the property to Bob Lewis and his Stoneliegh partners. Hill High was a wonderful venture in its heyday, Lowery recalled this week. “We had about 250 acres of apples and the same number of peaches. We also grew strawberries and vegetables,” he said. The business sponsored hayrides through the orchards, festivals down by the pond on the north side of Rt. 7, pumpkin carving and other community activities, he recalled. He discovered a wild apple that was propagated as Lowery’s Apple, according to Thomas.